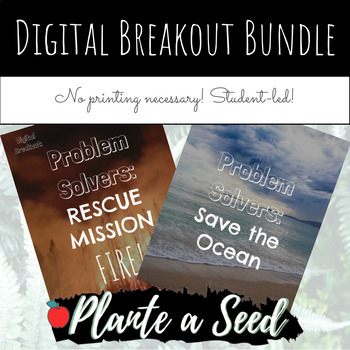 Earth Day Digital Breakout | Escape Room | Wildfires and Trash! Students will find real Newsela articles and statistics on the given topic. Teach the new generations to avoid plastic and prevent wildfires! My environment conscious breakouts will sure be a hit with the variety of puzzles! Younger kiddos can work alongside the teacher, and older kids can fend for themselves or compete against their classmates. ***The answer keys are located on the individual listings in the previews. I did that so I could upload without having a zip file or answer keys in their breakouts.